Oil drilling in Maui’s dolphins habitat up for consultation again. Home / climate change / Oil drilling in Maui’s dolphins habitat up for consultation again. The yearly block offer for areas the oil industry may want to drill in is again open for consulation. The process has become a yearly flash point for opposition to off shore oil drilling. The offered area includes part of the Tasman Sea about 25 kilometres off the west Coast of the Waitakere Ranges. Theoretically we could have oil rigs visible from the Piha shore. It is an issue I have taken an interest in since 2013. Essentially my position is that the West Coast is too precious to risk contamination, and in any event if humanity is to actually do something about climate change, then undiscovered oil deposits need to be left in the ground. And what better oil to leave than the really expensive sort where if an accident did occur our West Coast beaches would be devastated? One lesson of this work is unmistakably obvious: when you’re in a hole, stop digging … [t]hese numbers show that unconventional and ‘extreme’ fossil fuel – Canada’s tar sands, for instance – simply have to stay in the ground. In 2013 the block offer consultation occurred shortly after the election and Auckland Council did not seek the Waitakere Ranges Local Board’s views despite us having a special interest in what happens offshore of the Waitakere Ranges. The proposal at that time was to allow exploration to within 6 nautical miles of the shore. 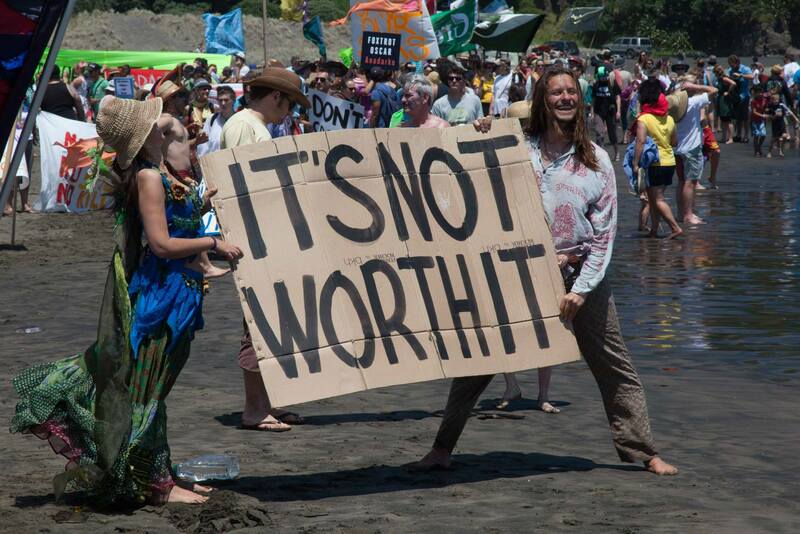 We also helped organise a protest on Piha Beach where the message was to leave the West Coast alone. In February 2015 the board opposed the exploration plans and urged Council to do the same. Saffron Toms and I went to Council to present our submission on the matter. We emphasised that the area was the habitat of Maui’s dolphin, a critically endangered species and that the seismic testing used by the Oil Industry would potentially cause much harm to them. We pointed out that the country’s oil spill response equipment was totally incapable of dealing with an off shore disaster. We urged Council to oppose the allocation of petroleum exploration permits in the West Coast area. Cathy Casey moved this as an amendment to the resolution and the voting went down to the wire. It required the casting vote of George Wood to note the amendment down. My opponent Linda Cooper voted against Auckland Council expressing opposition to oil drilling off the West Coast. She has since explained that she voted against the proposal because she believed there were better ways of expressing opposition to the drilling. She also berated those of us who drive cars to Piha and then oppose oil drilling. Call me old fashioned but I always thought the best way to oppose something was to say so. I am not advocating that we all stop driving immediately. Just that we start making changes. The 2017 Block Offer proposal is now open and submissions close on November 18, 2016. Hopefully this time there will be a progressive majority on Council willing to tell the Government that in order to protect very endangered species and preserve an area of immense beauty (while helping to prevent the planet from cooking itself), the West Coast of the Waitakere Ranges should be left alone.